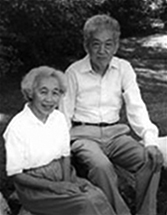 Tama and Jiro Ishihara were U.S. citizens of Japanese descent who, with their families, were interned in camps in this country during World War II. The Civil Liberties Act of 1988 was passed to compensate the surviving former internees $20,000 each for this wrongful internment. With this money, the Ishiharas established The Seitaro & Shina Ishihara and The Tameji & Chiyo Yoshimura Funds. These scholarships in their parents' names help deserving students continue their educations and educate the public in perpetuity about this action which was taken without due process of law and in violation of the equal protection clause of the U.S. Constitution. Since 1991, The Scholarship Fund of Concord and Carlisle has been able to award several scholarships each year and to tell this story as a result of the Ishiharas' generosity (See The Jiro and Tama Ishihara Memorial Scholarship Fund).